Rapper Dragon made history at Sha Tin this afternoon (Sunday, 19 March), teaming with Joao Moreira to win the 140th running of the HK$18 million BMW Hong Kong Derby (2000m). 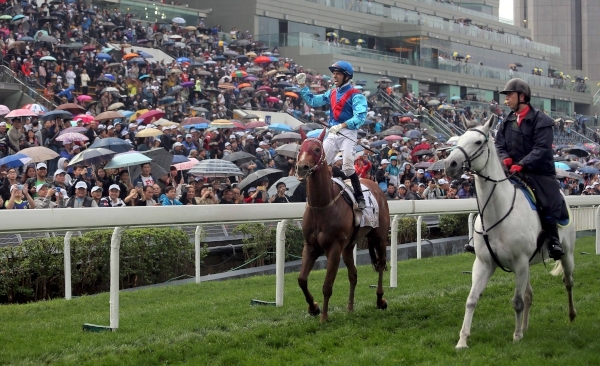 The John Moore-trained gelding ensured his place in the record books as the first horse to win all three legs of Hong Kong’s Four-Year-Old Classic Series. John Moore-trained Rapper Dragon (No. 1), ridden by Joao Moreira, edges Pakistan Star (No. 3) to win the BMW Hong Kong Derby at Sha Tin Racecourse today. Rapper Dragon became the first horse to record a Four-Year-Old Classic Series clean sweep. It was Moreira’s first win in the race. The champion jockey, a man accustomed to breaking new ground, was elated and teary-eyed after driving the 1.8 favourite through the rain to hold off the deep-closing Pakistan Star. “I got emotional, I was saying to everyone beforehand that it was the race I wanted to win the most and thanks to God that I achieved that,” Moreira said. “I was given a 100 percent fit horse by the team – John Moore, the mafoos, the owner – and we were able to deliver, so it’s a dream come true. 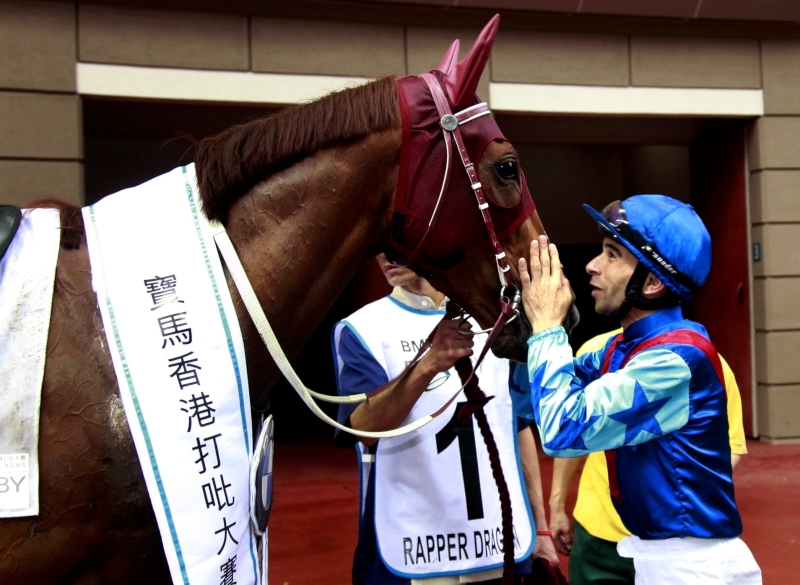 For Moore, Rapper Dragon’s win was a sixth in Hong Kong’s blue riband, the handler’s tally now surpassing all others – one more than Brian Kan. 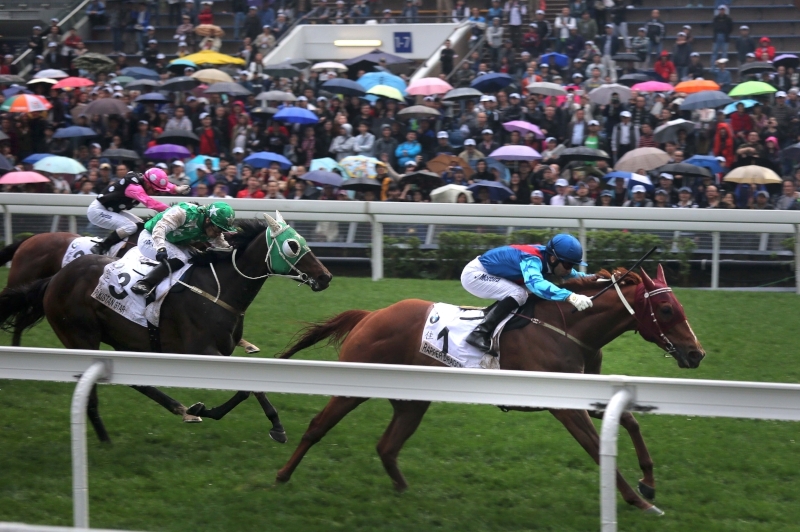 The Australian hailed the Street Boss four-year-old “My champion” after watching the chestnut confirm the superiority over his peers that he had shown in the Hong Kong Classic Mile (1600m) and Hong Kong Classic Cup (1800m). “This is a really classy animal, he’s done everything right, he progressed through the classes, today was the grand final and we won it. It was a great ride by the jock – it’s great that the horse has got some early speed so that he could lay up on a muddling speed,” Moore said after the gelding had scored by a length and three quarters in a time of 2m 02.88s. Rapper Dragon broke smartly from gate four and settled in a handy rail berth behind the pace-setters My Darling and then – from early in the backstretch – stablemate Rodrico. When Dinozzo skirted forward to press the lead on the turn for home, Moreira shifted Rapper Dragon off the fence and urged him forward; third turning in, an unbalancing bump from the fading Circuit Hassler did the 1.8 favourite no favours, but that proved to be a nondescript blip as Hong Kong’s latest star quickened to the lead and powered for home. The winning connections celebrate their success after the race. With rival Pakistan Star surging late and fast through a scorching closing split of 22.90s, Rapper Dragon gave his supporters a moment of concern. “He proved that he can overcome those circumstances,” Moreira, who ended the day with a five-timer, said. “When he got in front a little bit too early, he started to snake around a bit. He went in, he went out, I had to switch the whip, left and right, and switch it again. But good horses can do those things and still win the races. 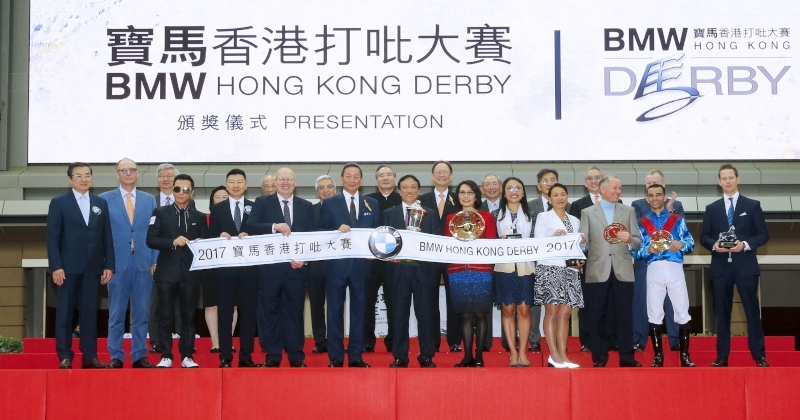 A group photo at the BMW Hong Kong Derby trophy presentation ceremony. Senior officials of HKJC and BMW toast and congratulate Rapper Dragon’s owner Albert Hung Chao Hong (fifth from left) after the horse’s victory in the BMW Hong Kong Derby. Moore believes he has another star on his hands, one that he expects will represent with distinction in upcoming Group 1 contests. Moore is favouring a drop back in trip and a tilt at the G1 Champions Mile at Sha Tin on 7 May, although the G1 Audemars Piguet QEII Cup (2000m) one week earlier remains a possibility. The Moore team sourced Rapper Dragon out of the Gai Waterhouse stable in Australia and today’s triumph took the Albert Hung-owned galloper’s Hong Kong record to seven wins from 11 starts. Pakistan Star, the horse purchased out of the Hong Kong International Sale almost exactly a year ago, was sent off the 7.1 second pick in the market. But the Tony Cruz-trained deep closer faced a stiff task on rain-softened going, described officially as good to yielding. “He’s run a nice race,” jockey Silvestre de Sousa said. “He stays well but he just got beaten by a nice horse. When I burst through he gave me a dash but when I got to the winner he just picked up again. Both horses went on the ground but when you ride a horse from the back it’s always a bit difficult, but I’m happy with the way he went through. The best horse won. The Shamardal gelding raced last of 14 and hit traffic on the turn before de Sousa found a clear path between rivals in the home straight. Pakistan Star clocked the fastest splits of any horse for the final two 400m sectionals (22.99, 22.90). No other horse ran a split inside 23 seconds. Moore, meanwhile, also claimed third thanks to the Zac Purton-ridden Beauty Generation. 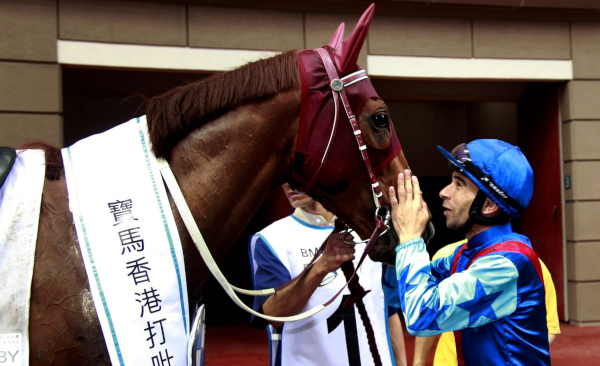 The Danny Shum-trained Seasons Bloom continued his smart form in the Classic Series. Second in the Classic Mile and third in the Classic Cup, the Captain Sonador gelding ran on for fourth under Nash Rawiller. Hong Kong racing resumes at Happy Valley on Wednesday, 22 March.